Author: André Motingea Mangulu. Series edited by: Wilhelm J.G. Möhlig, Bernd Heine. 12 pp. Roman, 122 pp. This grammatical sketch deals with the hitherto little-documented lect of the Ekonda-group Ilángá la Bakonda inhabiting the wetland area between the rivers Lotoi and Lokoro in the Mai-Ndombe District of the Democratic Republic of the Congo. The Lokonda language is neither taken into account in Malcolm Guthrie’s classification of Bantu languages of 1970, nor in Jouni Maho’s revised version of 2003. It was how­ever classified under the token C.64 among the languages of the Mongo-Nkundu group by Yvonne Bastin. Due to the physiogeographic characteristics of the region, the Ilángá la Bakonda are exposed to rather limited direct contact with other groups and largely remained spared from the invasion of belligerent neighbouring groups like the Bombomba, for example. Therefore, their language is of great interest espe­cially from the perspective of Historical and Areal Linguistics. 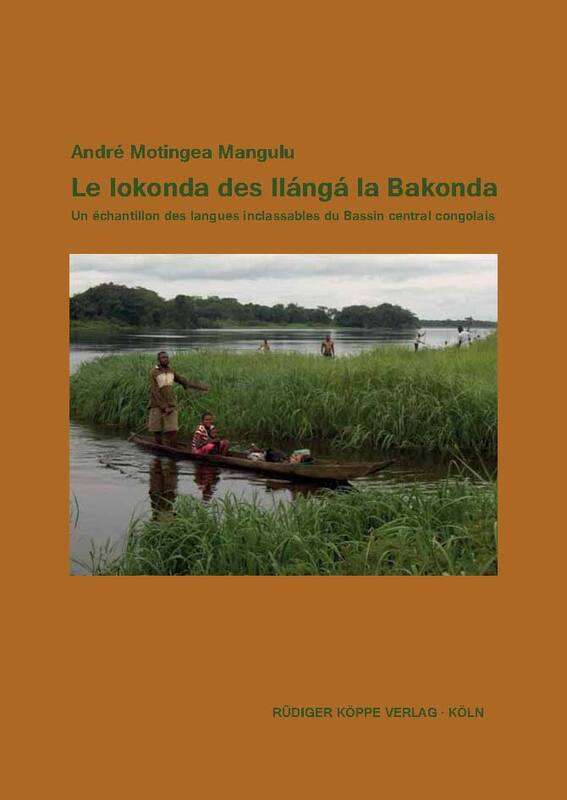 Beyond the mere documentation of this Lokonda variety, the present sketch is thus intended to contribute to a better understanding of the history of language contact and migration in the Central Congo Basin. The book is based on language data collected in the 1940s by P. Hugo Rombauts, a missionary of the Congregation of the Immaculate Heart of Mary, employing the Hulstaert questionnaire. The respective transcription is retained here to a large extent and only amended by tone markings. In addition to Rombauts’ notes and other grammatical descriptions and dictionaries of related varieties, the present book incorporates primary data from an article by Jules de Boeck on Lokonda speech art as well as from a text of an Ekonda musical comedy registered by Daniel Vangroenweghe, which is contained in the appendix of this sketch including interlinear morpheme-by-morpheme glosses.